What did you enjoy most about The Secret History? Who is your favorite character? What do you think of Theodora? What do you see as her greatest strengths and flaws? When does she win your admiration and when does she earn your disapproval? 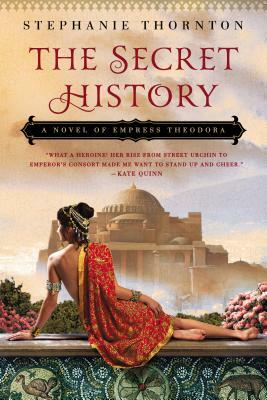 What role does luck play in Theodora’s life? Is Theodora a good mother? Is Antonina a better one? Discuss the friendship between Theodora and Antonina. Is theirs the kind of friendship you hope to have? When do they save each other? When do they betray each other? When Macedonia pleads for Theodora’s help after an earth-quake leaves her destitute, Theodora deliberately decides not to help. Discuss why she makes this choice and how it comes to haunt her. Would you have done the same? What do you think makes Theodora and Justinian’s marriage so successful? Justinian is a dedicated ruler. Is he an effective one? Discuss the tactics he uses to acquire and retain power. Do they interfere with his ability to rule wisely? Can you imagine living in Constantinople in the fifth century AD? What kind of life do you think you would have there? What would you most like and most dislike about living in that time and place? Plague had a devastating effect on the Byzantine Empire. Discuss what you imagine the world of today would be like if half the population was suddenly wiped out by illness. Have you traveled to any of the places mentioned in the novel, in particular to Istanbul, the current name for the city that was once Constantinople? How do the places you experienced compare to the way they’re described in the book? What do you hope to remember about this novel?